Sometimes it is the simplest solutions that work the best. This Single Reinforced Nasal Helmet looks like a relatively simple helmet, and that is the truth. But this simple helmet is also based on a design that is highly effective and highly protective. 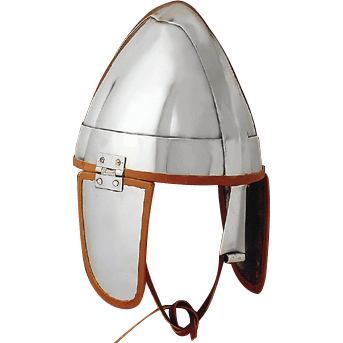 This helmet is a subtle variant of a classic Norman helmet, featuring a ridged, raised crown that helps to deflect and guide glows off the top of the helm and down its sides. The helmet also features a nose-guard at the front to add a subtle degree of facial protection, as well as hinged flaps on the sides that cover the sides of the wearers face. Brown leather lining runs along the rim of the helmet, as well as the edges of the hinged flaps, adding a touch of color to his helmets otherwise steely look. The helmet is made from quality metals and materials, and it features a polished metal look that ensures an impressive appearance. 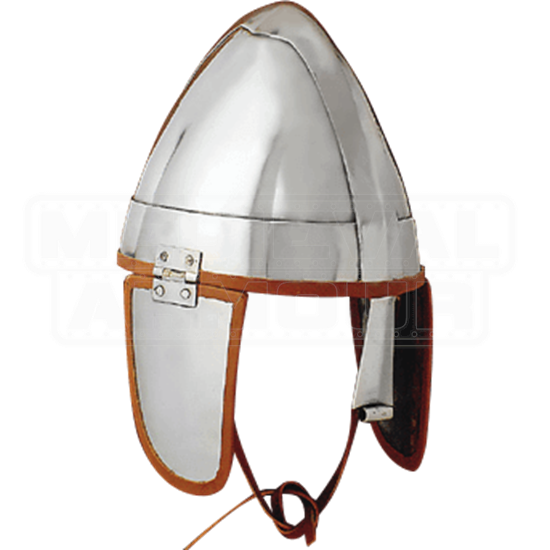 Don this helmet and ride into battle with your Norman allies or Viking comrade, or you can also put this impressive Single Reinforced Nasal Helmet up on a shelf, to display its simple yet remarkable form along with the rest of your collection.